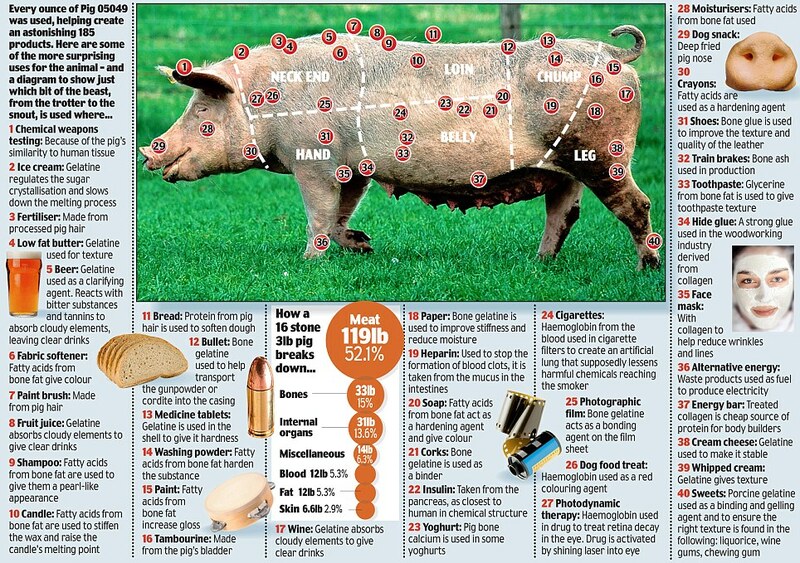 And Yet They Deny: WAKE UP...WE/OUR CHILDREN ALL ARE EATING PORK SUBSTANCES FROM MANY SOURCES??? WAKE UP...WE/OUR CHILDREN ALL ARE EATING PORK SUBSTANCES FROM MANY SOURCES??? TO INFORM US ABOUT THE PRESENCE OF PORK SUBSTANCES IN ALL WHAT WE EAT AND CONSUME??? When people tuck into a bacon sandwich, few of them wonder what has happened to the other parts of the pig whose life has been sacrificed so we can enjoy a juicy breakfast. Identified by its yellow ear tag number, 05049, her pig trail ended with her identifying an incredible 185 different uses to which it was put - from the manufacture of sweets and shampoo, to bread, body lotion, beer and bullets. Although not all sweets in the UK contain pork gelatine, many do - including Marks & Spencer's hugely popular and aptly-named Percy Pigs sweets. Christein, from Holland, found that while some companies were reluctant to cooperate in her quest, others claimed that they didn't even realise their products contained elements taken from a pig because of the middle men involved in the complex distribution process. The confusion is not helped by the fact that it is not clear on products' ingredient labels where they originally came from. According to Richard Lutwyche - a British pig farmer with more than 60 years experience, chair of the Traditional Breeds Meat Marketing Company and a member of the British Pig Association - the reasons for much of this confusion is due to the industrial-scale of much pig farming. Some makers of cigarettes use haemoglobin from pig's blood in their filters. Apparently this element works as a sort of 'artificial lung' in the cigarette so, they claim, 'harmful reactions take place before the chemicals reach the user'.